At the Mews Dental clinic we appreciate that a bright healthy smile can help you feel better and more confident about yourself. Your smile is the first thing that people notice about you and we can help you achieve a great smile. Like hair and skin, teeth can vary in colour; some are yellower or darker than others, even when they are healthy. Lifestyle and ageing can lead to darkening of the teeth and the loss of natural tooth brightness. Often whitening alone can be enough to make big changes to your smile. Putting the white back can be simple, yet very effective! This is a safe, convenient and simple method of tooth whitening, using a mild bleaching gel in custom made trays, which cover the teeth. 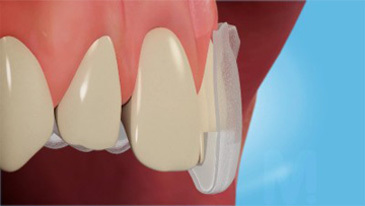 We will take impressions so that these trays can be made by our technicians. The trays are worn at home daily, usually overnight, for a 10 day period to achieve optimum results. Some patients may experience a degree of tooth sensitivity during this period, which ceases at the end of treatment. The result achieved will vary from person to person, and is dependant on the starting shade and the original natural colour of the teeth, with the final result not always being predictable. Whitening will not change the colour of fillings, crowns, bridges and veneers. Intermittent top ups of the treatment are advised and these can easily be done at home with your whitening trays. This will keep your smile looking great. The whitening products used by dentists are carefully controlled, so that no damage is caused to teeth. Some products available in beauty salons or to buy are based on a chemical, Chlorine dioxide, which can cause significant damage to tooth structure and gums. Tooth whitening is a better option than a crown or veneer if you want to lighten the colour of healthy teeth.The placing of crowns and veneers involves the loss of healthy tooth structure and changing the shape of the tooth.